When First Watch Officers received their own commands, they sometimes instructed that the insignia of their old boat should be painted on their new boat. Such was the case when Oberleutnant zur See Engelbert Endrass took command of U-46 on the 22nd May 1940. 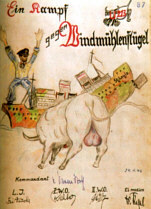 The copying of the bull insignia by Endrass is hardly surprising, given his part in the creation of the famous drawing. Endrass definitely used the bulls on U-46 as a personal insignia rather than a flotilla insignia. The order for boats of the 7th U-Flottille to adopt a snorting bull did not take place until after Prien's demise in 1941, long after U-46 had been prowling around with bulls on her conning tower. 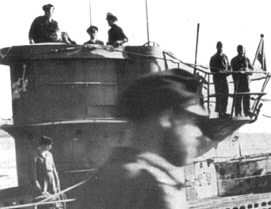 The snorting bull emblem on the conning tower of a damaged U-46, commanded by Engelbert Endrass. The eyes of U 46's bulls were circles rather than dots. After serving on U-46, Endrass took command of the Type VIIC U-567. 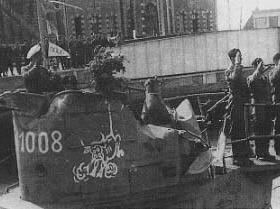 The short propaganda film which was shot aboard U-567 shows that a particularly large pair of bulls adorned the boat's tower. Another interesting fact which can be ascertained from the film is that the crew of U-567 also wore snorting bull badges on their caps. 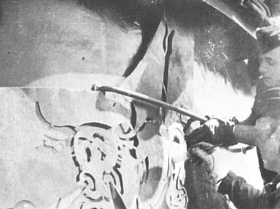 Left: A snorting bull being applied by stencil to U-567, which was also commanded by Endrass. 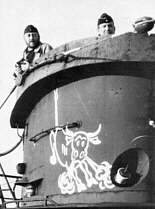 Right: A particularly large bull insignia on the starboard side of a U-boat belonging to the 7th U-Flottille. The boat may possibly be U-567. Some of the wartime propaganda footage was used in the 1958 movie U47 – Kapitänleutnant Prien. The real U-567 doubles for U-47 in some parts of the film because of the snorting bull insignia on her tower. Historical accuracy is certainly not the movie's strong point. Not only does the U-47 in the film have snorting bulls before the Scapa Flow mission, but Prien's demise strays slightly from the accepted version in the history books. When U-47 is sunk, Prien manages to swim towards a nearby merchant ship and drag himself aboard. It is not Günther's day, for soon afterwards he is killed when the merchant ship is torpedoed by a U-boat. In the ironic finale to the film, we see that the U-boat which has caused the death of Prien is commanded by none other Endrass himself! The Type VIID U-213, commanded by Oberleutnant zur See Amelung von Varendorff, sported one snorting bull insignia at the front of the tower. Before U-213 joined the 7th U-Flottille, the boat was assigned to the 5th U-Flottille, which specialised in fitting out and provisioning boats before their first patrol. The flotilla's visitors' book included a number of illustrations, including that of U-213. Since U-213 had yet to join the 7th U-Flottille, the endorsement of a bull insignia by that boat surely resulted from von Varendorff's former association with U-47. Left: The single snorting bull, facing to the left, at the front of U-213's conning tower. Right: The illustration for U-213 in the visitors' book of the 5th U-Flottille. Dated on 24 January 1942 and signed by von Varendorff and his officers it depicts a rather well-endowed bull charging a broken enemy vessel, but in its short career U-213 was unable to register any successes.